It sure looks like to me there`s at least two grimacers in this one. We were on the ski hill last season and somebody had to have shot this pix during an extreme emergency. The boy in the middle is Mick, or, me. I had to tell them to go into the trees, right away...and dig holes with both ski poles...as deep as possible. The two woodsmen can definitely ski, but, I hope they were wearing quick release Gore-Tex. 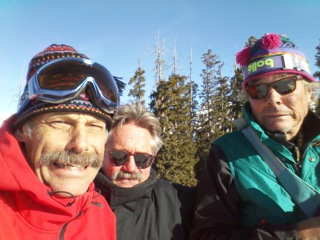 We senior skiers must be always prepared....all three boys here are veterans who know the woodman`s drill. Today our KOTO Radio Ski Swap started. There was a checkout line that was so packed I had to bribe a buddy in front of that jammed line with a $20 bill to pay for my new pom pom hat...the tag read only $14. I don`t really need it, but, we all have to buy something at KOTO swaps. KOTO stages these things every November in the parking garage below our library. The place was swamped with goodies...almost overwhelming. And all those plundering Telluride shoppers reminded me of the old newsreels of rioting women at a Macy`s Ladies Undergaments Sale in NYC. I was always amazed at how dangerous those women looked. KOTO needs the money. Our ski hill needs more snow.